Our group had the wonderful opportunity to travel to Ames to learn more about the Visioning Process and to take part in some exercises that showed how the process will unfold over the next year. 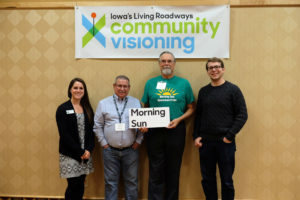 As Morning Sun begins it’s Community Visioning journey we find ourselves in Ames, IA receiving wonderful mentorship from the professionals of Iowa State University. Our experience today in Ames has left us with so many ideas to improve our community.